​XIAOMI: Will the “Apple of China” recover on the market after disappointing performance? Xiaomi is mostly known for being the world’s fourth largest smartphone producer after Apple, Samsung and Huawei. On the 9th June 2018, Xiaomi sold its shares to the public in what was supposed to be largest tech IPO since the 2014 listing of Alibaba. However, Xiaomi’s IPO fell short of expectations. The original ambition of valuing the company $100 billion was offset by rising market pessimism in the months preceding the IPO. The unleash of the US-China trade war and rising doubts concerning Xiaomi’s business model caused Xiaomi to scale back its market capitalization to $54 billion, pricing the stock at HK$16.80 per share on the Hong Kong Stock Exchange. Despite this, the share price still proved to be overvalued in relation to the company’s fundamentals. Indeed, the stock price has plummeted to HK $11.38, representing over a 30% decline in value since the IPO. Does this decline in value signal an opportunity for investors to invest in Xiaomi or is the company’s stock still overvalued? Valuing Xiaomi has led to controversies amongst investors due to its very peculiar business model. Shou Zi Chew, Chief Financial Officer of the company, says: “We are a new species… we are a combination of internet company, hardware company and ecommerce company, and there's no point trying to put us in any traditional bucket”. When the company was aiming for a $100 billion valuation in its IPO, there was a belief amongst investors that Xiaomi had the potential to become a dominant player as an internet services provider and e-commerce firm as well. However, the higher stream of revenues coming from the sales of hardware soon convinced investors that Xiaomi could be better classified as a hardware company. Hardware companies tend to trade at lower price to earnings ratios on the market, which is why Xiaomi only managed to secure a $54 billion valuation in its IPO. The high reliance of the company’s revenues on the sale of hardware can be seen in the table below, which groups Xiaomi’s revenue streams in 2017 and 2018 into three categories. As we can see, in 2018 roughly 66% of revenues came from the sale of smartphones. Another 25% of sales comes from what the company classifies as “Internet of Things and Lifestyle products”. These include a variety of smart devices and home appliances, such as: smart televisions, notebooks, smart watches, electric scooters and air conditioning devices. Not all products in this category can be formally classified as hardware, but to the eyes of an investor they don’t differ from hardware in terms of profitability and contribution to the company’s income streams. What investors heavily pay attention to when evaluating Xiaomi is the 9% segment which the company defines as “Internet Services”. It is this segment that, according to the CFO Shou Zhi Chew, makes an internet and e-commerce company as well. More than 60% of income from provision of “Internet Services” comes from advertising fees the company earns by advertising products of other companies on its platforms. By having a wide platform of consumers using its devices, Xiaomi has a competitive edge in advertisements as it is able to match advertisements of new products to each user’s interests by looking at their viewing history. Other than simply advertising products, Xiaomi as also has an e-commerce platform named “Youpin” in which it actually sells and delivers products of third party companies. In addition to this, Income from “Internet Services” also includes subscriptions by users to access premium entertainment content, such as online games and music streaming services. This aspect of the business is most appealing to investors due to its very high profitability. Indeed, Xiaomi makes a 64.4% gross margin from its “Internet Services” sector, which is very high, especially if compared to the margins that the company makes on its sale of hardware. In 2018, gross profit margins from sale of hardware have been equal to 7.3%, whereas net profit margins have been even lower at a value below 1%. These low specific margins on hardware are not an industry specific characteristic. Indeed, companies such as Apple or Samsung have gross profit margins of about 38%. The low margins on the sale of hardware reveal the corporate strategy of Xiaomi, which aims to sell high quality smartphones and hardware at very low prices to attract customers to its wide platform of products and increase consumption of “Internet services”. This explains why some investors tended to categorize Xiaomi as an internet company, since the long-term goal of the company clearly seems to be to have to greatest portion of its income stream coming from internet services. However, the reality is that internet services are still not generating enough revenues and Xiaomi’s hardware business alone is not very profitable. This is why the company’s valuation has been decreasing both before and after the IPO. The revenues of the company have risen overall by 52.6% year-on-year between 2017 and 2018, reaching 174.9 billion RMB. This has happened despite slowing smartphones sales both globally and in Xiaomi’s greatest market, China. 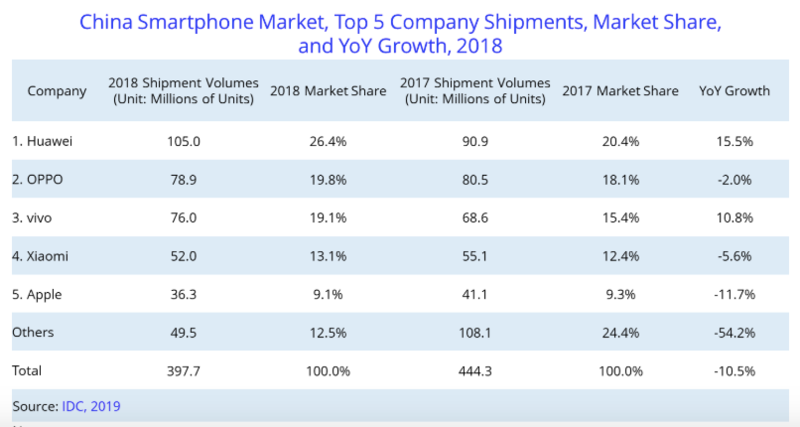 Indeed, global smartphone shipments have declined by about 4.1% (according to research firm IDC: https://www.idc.com/getdoc.jsp?containerId=prAP44865419), with China performing worse than average by witnessing a 10% decline in shipments. Not only has the Chinese market performed badly, but Xiaomi has lost ground vis-à-vis its main competitors, observing a 5.6% decline in market share. According to Ahmed Mohamed, analyst at market research firm IDC, this decline in market share is due to the fact that Chinese consumers are looking to “upgrade their low-end devices to more expensive models”, whereas “Xiaomi is very strong in the lower price segment”. This is clearly a warning sign for investors who wish to invest in Xiaomi. The company’s strategy of selling low price smartphones to attract consumers to its “Internet Services” seems at risk on the long-term as the Chinese market becomes more saturated and Chinese costumers spending patterns change. This is worrying as the Chinese market contributes to about 60% of Xiaomi’s smartphone revenues and to 40% of overall revenues the company generates. In particular, China was supposed to be the country in which Xiaomi built a sufficiently wide platform of users to boost its “Internet Services” area. Without great performances in the Chinese market, the transition from being mostly a hardware company to being mainly an internet and e-commerce company seems to be at risk. However, what has allowed to company to increase its revenue in 2018 has been the increase in revenues coming from international markets, with 40% of smartphone revenues now coming from overseas markets such as India, Indonesia and Western Europe. In India, Xiaomi has registered the highest number of shipments for six consecutive quarters with a 29.9% market share, the highest in the industry. By having six manufacturing plants in India, Xiaomi is able to produce locally 95% of the smartphones it makes, creating a stronger tie with the community and significantly reducing costs. This has allowed it to slash prices and gain huge success with its low-priced smartphone in a market where average annual income is still less than $2,000. In Indonesia, the company has grown massively in the last year, showing a 300% year-on-year growth in market share, from 6.1% to 21.2%, and becoming the country’s second largest smartphone vendor. In Western Europe, the company has become the fourth largest smartphone vendor after Samsung, Apple and Huawei, with a 415.2% year-on-year growth in market share to 3.2%. The future of Xiaomi will depend on its ability to increase its net income over the next years. Indeed, in 2018 the company posted an adjusted net profit of RMB 8.6 billion, making a 5% net profit margin, which is perhaps too low considering the company’s valuation. The ability to increase net income and justify its valuation, which today still seems to be too high, will depend on two things. The company will either have to increase its profit margins on the sale of its smartphones or increase the amount of revenues coming from internet services. Regarding the first option, Xiaomi has already started introducing higher premium phones. Yet, the philosophy of the company seems to still be to leverage on lower premium phones to increase access to its internet services platforms. This is also in line with a promise made by Lei Jun, founder of Xiaomi, in April 2018: “Xiaomi hardware business will have an overall net profit margin that will not exceed 5% per year. If the net margin exceeds 5%, we will return the excess to our users”. The future of the company will therefore pass through an increase in revenues from internet services. In this sense, with a declining Chinese market, India seems to be the ideal place for Xiaomi to build an ecosystem of products and expand its “Internet services”. Research shows that around 1 billion Indians still don’t have a smartphone, representing a huge opportunity for growth in the smartphone market and other hardware products. As Xiaomi is the smartphone seller with the highest market share in India, it will have to be good in retaining its competitive advantage in the following years. Another opportunity for Xiaomi will come from the digital banking sector, in which Xiaomi also operates as part of its “Internet Services” with a branch named “Xiaomi Finance”. Indeed, Hong Kong authorities are preparing to issue digital banking licenses to Xiaomi and other six companies (amongst which also Tencent and Alibaba) to carry out online banking services. According to Goldman Sachs, at stake is about an estimated pot of $15bn in annual revenues which new entrants will try to subtract from existing banks, which have up to this moment offered a low quality of online banking.